Understanding how applications work can be a little tricky, we know, so we have prepared a couple of scenarios to walk you through all the steps a user has to relate to.We will also show you how sharing works and how you can implement support for it in you application. A teacher logs in to itslearning and enters a course. From the add menu he can add a number of different learning tools. He adds a test, creates questions and then activates the test for the students in the course. A teacher accesses "Add learning activity" from within a course - a new learning object instance (with a unique LearningObjectId and LearningObjectInstanceId) of this learning tool is then created in itslearning for this course. She is directed to the ”Add instance URL” specified by the application developer upon registration of the application. The 3rd party application requires the teacher to fill a form it with content, for example by creating questions for the students to answer. The application then prompts the teacher to save her work. The application specific data (such as the questions in this example) are stored by the learning tool on the 3rd party provider's application server. Later that day a student belonging to the course logs in to itslearning and is notified in a task list that a new test has been added to a course she participates in. She clicks on the test, answers the questions and submits the test. The student accesses the test: The student is taken to the ”View instance URL” specified by the application developer, when creating the application. The student will have participate permission allowing her to submit an answer. The next day the teacher logs in to itslearning again. He browses through the recently submitted answers. The test is automatically assessed, and he goes through the report to see how each of his students has performed. The teacher clicks on the test: She is taken to the ”View instance URL” specified by the application developer. The teacher will have the evaluate permission allowing him to see reports. Reports from both third-party tools and the built-in itslearning tools are visible in a report visible for the teacher. This allows for a good overview for the teachers when they are grading the learners in a course. The teacher can now share the test with other teachers on his school, his local authority or the whole itslearning community. The itslearning platform is based around a solution solution where teachers can share content with other users. Teachers can choose who to share with; users on her/his school, with users on other schools in her/his local authority or with users in the entire itslearning community. Roger is a teacher at Chesterton College. He creates a quiz and uploads it to his library. The quiz allows students to answer ten questions, and a report is generated and sent back to Roger after the quiz is taken. Roger shares the quiz in his library, allowing other teachers to use his quiz in their courses. The quiz that Roger made has a unique LearningObjectId which is shared in the library. Other teachers can add this learning object to their course. This will then generate a new instance with its own LearningObjectInstanceId but the LearningObjectId will be equal to the one Roger created. Two teachers, Frank and Irene work on different schools but both are using Roger’s quiz in their courses. They add the quiz to their courses in itslearning, and ask their students to answer the quiz. The quizzes used by Frank and Irene both have the same LearningObjectId as the one Roger created, since the quizzes are just different instances of the same quiz. Thus they all have different LearningObjectInstanceIds. Christina and Richard, two of Frank’s students takes the quiz and receive an A and a C in the quiz. At the same time, two of Irene’s students get a D and an E. Even though the quiz is borrowed from the same library, the answers generated in the different courses are not connected. When the quiz is changed by Roger the quiz in Frank’s and Irene’s courses are automatically updated, but the results from the students are not changed. When students answer the quiz the unique LearningObjectInstanceId is used to determine which course the reports received from the learning tool belongs to. Since the learning object is the entity to which the content is connected, all instances of the object change when the object itself changes. As the content is stored on the application server and not in itslearning, the reports (which are stored in itslearning) are not affected by a change in the content. Creating an application that supports sharing may look complicated at first glance, but please take a look at the following example. It is definitely worth to implement support for sharing, as the value of your application will increase a lot! It is really a powerful feature to be able to create content in one place and easily share it in many different courses. "History, Industrial Revolution" is a test. It contains a lot of questions that are connected to LearningObjectId. Users with Participate permission should be allowed to submit answers. As you can see the title can be different in the various courses for the same content (LearningObjectId). Also the deadline, assessment scale, and when the test is active can vary from instance to instance, ModifyInstance or Modify Permission is required to change these properties. There is one exception to this scenario. When an element is "Unpublished" in the Library (i.e. only the author and co-authors can see it), then we allow the author and co-authors to edit the element in the Course. This means that when the element in unpublished, we will grant the 'Modify' permission, even though the element is shared to the Library. When the author publishes the element (so it is available to a Organisation, Site or Community), the situation described above is leading again. 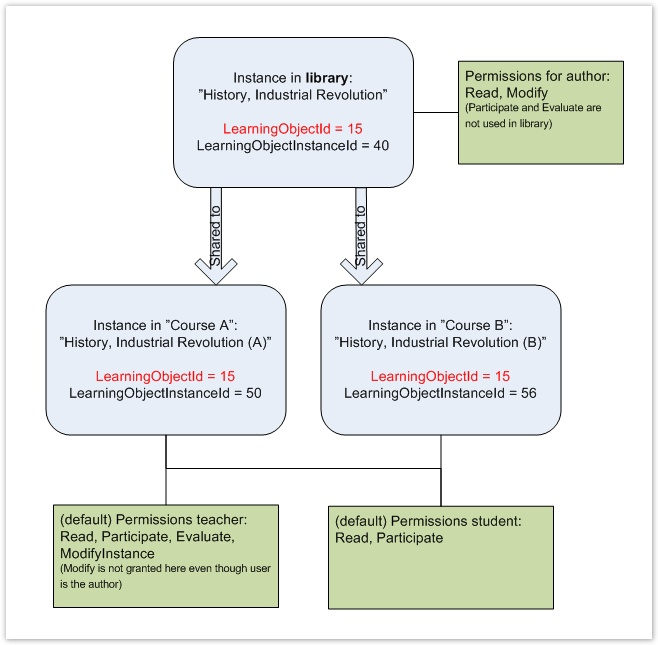 When you create data model and business logic for an application that supports sharing, you should be careful when deleting and editing content connected to a LearningObjectId, because it can be shared between many instances. E.g. marking records as deleted instead of physically deleting them and think about sharing scenarios when designing user interface will help. Important: When a user in itslearning adds an instance into a course which refers to a library instance, the view page for your application will be called - not the add page. This is because content should already be in place. However, if your application depends on some settings on instance level before view page can be shown, feel free to redirect user to an appropriate page. In the example above this may be setting assessment scale to use etc.